“This is a treasure. Those familiar with Beecham’s unique way with this score from the famous film version will find this infinitely more gratifying. The singing here is much superior [and] Immortal Performances has managed an edition vastly preferable to earlier releases of this performance on Myto and Melodram (I never heard the Beecham Society LPs, which served as the source of those CD versions). Pitch has been corrected (it was inconsistent,to say the least, on the other versions), and dynamic compression has been overcome to the extent possible. Producer Richard Caniell used ABC transcriptions and acetates from the Jobin collection in Canada. There are many aspects of this performance that bring pleasure, but at the center is Beecham’s conducting. He clearly loved this opera, and conducted it regularly since 1910. 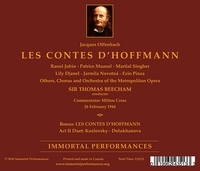 The opera is a structural mess, whether in this version published by Choudens or even in the myriad ‘critical editions’ that have been created since. What can make it work is a conductor with a sense of theatrical pacing, a deep belief in the value of the score, and the ability to get an orchestra and a cast to perform it with similar conviction. This is precisely what we have here. The sense of musical and theatrical ensemble is not just from the orchestra, and not just between singers and orchestra, but also among the singers themselves. Every singer is truly interacting with every other singer, communicating a rare degree of dramatic and comedic authenticity. 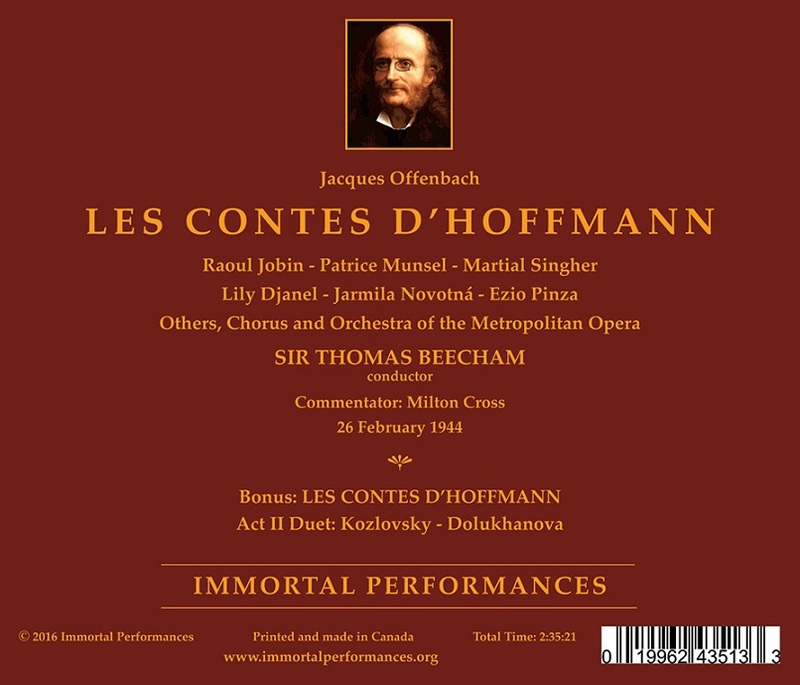 LES CONTES D’HOFFMANN is a work that veers between absurdity, drama, romance, tragedy, and comedy. Beecham captures all of those moods, and manages to meld them into a unified whole. Jobin was a Canadian tenor who was a mainstay in the French repertoire at the Met between 1940 and 1950. He was also known for his Lohengrin and Walther, and in Europe sang other dramatic roles like Radamès. While his timbre lacks the uniqueness and beauty of his predecessor Georges Thill, it is still an extremely attractive voice, and he was a scrupulous musician, with impeccable diction, rhythm, and pitch. His Hoffmann is one of the finest on records. He and Beecham are perfectly in tune with each other, and the musical give-and- take in, for instance, ‘The Ballad of Kleinzach’ is enchanting. Jobin knows the French style, and his comfort with the idiom contributes to the success of his performance. 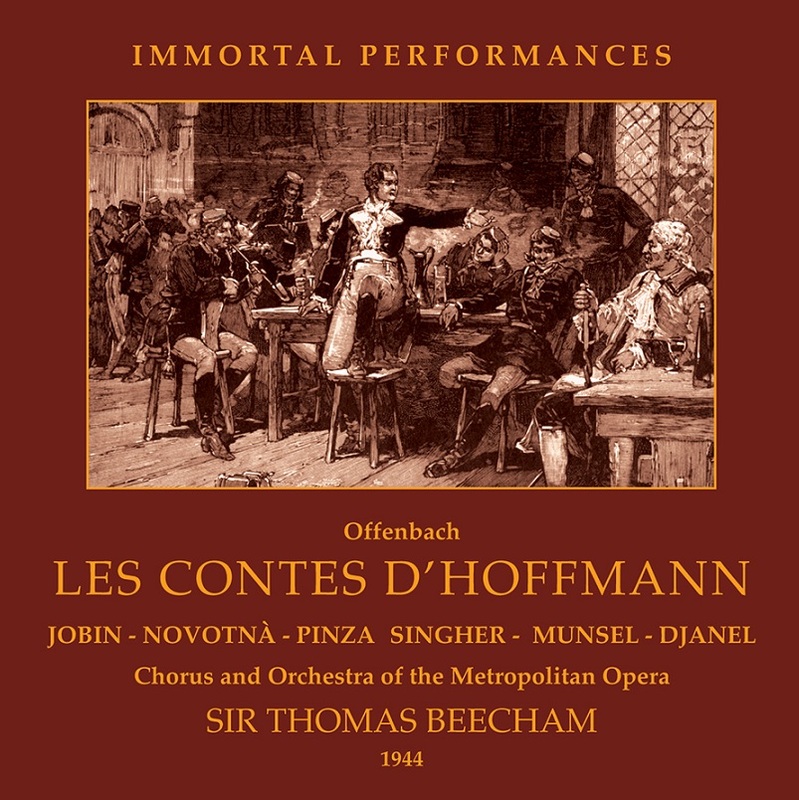 LES CONTES D’HOFFMANN should, in theory, be given with one soprano and one bass-baritone in the roles of Hoffmann’s loves and his adversaries, since the characters are, in Offenbach’s mind, all manifestations of the same obsession of Hoffmann. Although there have been singers who did assume all the roles, it rarely works out well because the vocal writing and character of the music require different vocal and dramatic skills. The Met’s solution here is far more satisfying: an all-star cast with almost every singer perfectly suited to his or her role. In his superb program notes, Dewey Falkner rightly observes that Ezio Pinza’s French is less than idiomatic and he has some difficulty with the passagework written for Coppélius. But it hardly matters because, as Falkner puts it, ‘he has voce voce voce’. The extraordinarily deep and rich timbre that Pinza brings to both Coppélius and Dr. Miracle provides us with something unforgettable. I have not heard anything like it since in either role. Another standout is Jarmila Novotná as Antonia. The voice itself is ravishingly beautiful, her way of shaping phrases is particularly affecting, and she is extremely convincing in Antonia’s shifting moods between fear, joy, sorrow, and determination. The Antonia act is extraordinarily effective because of Novotná, Jobin, Pinza, and Nicola Moscona’s richly sung Crespel. Martial Singher made his Met début in 1943 as Dapertutto in this production, already an accomplished singer from Paris. He was one of the great French baritones of his era, not so much for the quality of his voice as for his intelligence and musicianship. He himself was quoted as saying ‘my voice was of average quality, but it was versatile and capable of projecting character, I think’; indeed it was, and his is a superb version of ‘Scintille diamant’. The successes of the cast continue with Patrice Munsel, heard here in her first season with the Met, triumphantly getting through Olympia’s coloratura challenges. Falkner notes that she isn’t as ‘mechanically precise’ as some singers impersonating this doll, but it is glorious singing and it makes more convincing Hoffmann’s infatuation with her. Extravagant casting brings us Margaret Harshaw as the voice of Antonia’s Mother and the wonderful Alessio de Paolis as Spalanzani, Pitichinaccio, and Frantz. Mack Harrell is also excellent as Lindorf. Only Lucielle Browning lets us down a bit in the role of Niklausse. This is a case where the whole is even greater than the sum of its parts, as good as those parts are. I have rarely been so utterly swept along by Offenbach’s inspired but unevenly constructed work. Beecham and his cast make you forget the flaws and simply propels you into Hoffmann’s bizarre world. As if all of that weren’t enough, Immortal Performances adds a six-minute bonus - a truly gorgeous recording of the Hoffmann-Giulietta duet with two of Russia’s superstars from the middle of the twentieth century. Zara Dolukhanova and Ivan Kozlovsky are thrilling. I was familiar with Kozlovsky’s recording of the Kleinzach Ballad, but had not heard this before. Apparently those two are all we have of his Hoffmann, and that is a real loss. Several weeks later at the Met Singher sang his first Pelléas. Mr. Thomson found him ’the glory of the evening, vocally impeccable and dramatically superb’. Olin Downes of THE NEW YORK TIMES hailed the baritone as ‘a fine and experienced artist, an authoritative actor, one firmly grounded in the traditions of his language and stage action and a potent element of the occasion’.